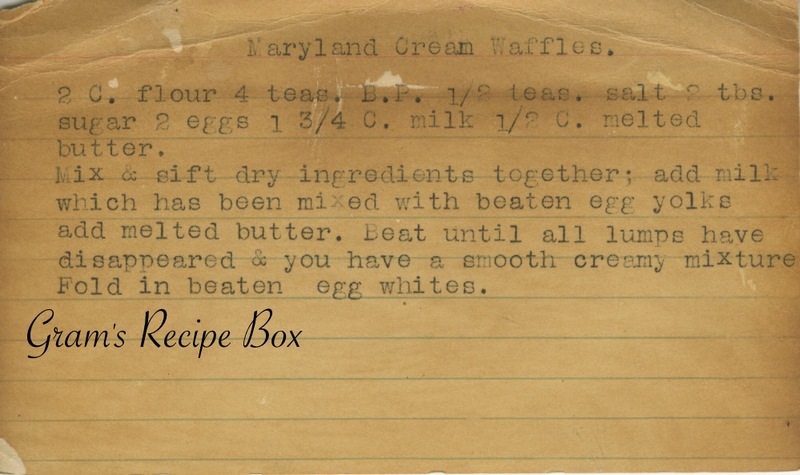 So this recipe for Maryland Cream Waffles dates back to at least the 1940s, possibly earlier. All the reviews I have read about them indicate they are to die for and are far superior to other waffle recipes. I like to eat waffles but I am pretty bad at making them. I always seem to open the waffle iron too soon and they tear, or too late and they have burned. Seems like it would be simple with one of those light indicators but no, I might have given up on waffles last time. Maybe. Mix & sift dry ingredients together; add milk which has been mixed with beaten egg yolks, add melted butter. Beat until all lumps have disappeared & you have a smooth creamy mixture. Fold in beaten egg whites. This is quite similar to the waffle recipe I make ALL.THE.TIME. The proportions are a wee bit different and mine calls for oil rather than butter (yummy!) but I think the secret is really in the egg whites being incorporated separately. I think you guys will have to come down for a waffle party brunch this summer. I’d say breakfast, but who wants to get up that early. I’ll teach you how to make a perfect waffle. Even my secrets for pink and/or purple waffles. M would LOVE that. That sounds delightful! Let’s make plans. The official review of Maryland Cream Waffles is in after making a 1/2 recipe this morning. I can’t believe I ran out of flour and only had enough for a 1/2 recipe. I hang my head in shame. All told, this is a decent recipe and it would be better than a standard boxed mix. However, the recipe we use on a constant basis makes a crisper, fluffier waffle. These never really developed that crisp exterior and fluffy interior. They didn’t seem to rise as much to expand to fill the waffle iron. I think that is why they didn’t get as crispy–not as much direct contact with the iron. I don’t know if the oil I use (same amount) in my recipe makes it crisper or if it’s the amount of baking powder. Geneva actually likes this one better than our standard waffle recipe. I think it’s because she didn’t use any syrup today so the slight butter flavor was more pronounced. She said they were “fluffier” but I think that actually translate into a softer waffle. Danica and I like our old standby better, but we also used syrup and you need a crisper waffle to stand up to the syrup. I think when you guys come down for a waffle party, I’ll do a blind taste test for you and you can be the judge. All I can say is that the best waffles use egg whites folded in. It really is worth the extra step.